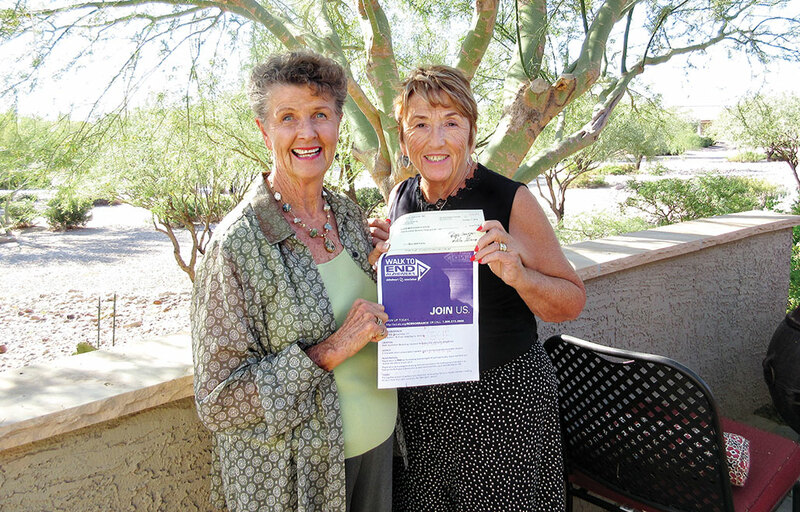 Mary Beth Fisher presents to Terry Price, chairperson for the fourth annual Walk to End Alzheimer’s, a check for $173. The RR National Mah Jongg League, Inc. players select a charity annually, and the money donated is from their order of Mah Jongg cards for the year 2014. The Walk to End Alzheimer’s was held November 15 and raised over $6,000 for the Arizona Chapter of the Alzheimer’s Association. The money makes possible support services, education, advocacy and research. Participants walk in support of those who are currently living with Alzheimer’s, those struggling with caregiving responsibilities, or to honor lives of those who have lost the battle. Many thanks to all who participated and those who donated.